This very well maintained home with ''Tropical Island Flare'' offers so much space and outdoor areas to relax and enjoy! Built in 1987, features two Bedrooms with one full size bathroom and room for a second bathroom if you want! The roof covering is metal, with central air conditioning, sturdy tile flooring through out and many upgrades to include new fixtures, bathroom vanity, new appliances, plumbing, kitchen sink and fans! Exterior siding has been painted a cheerful Key Lime Green to reflect our ''Island Paradise Attitude''. Side entrance ramp with for easy accessibility that wraps around to the spacious deck surrounded by lush tropical landscaping for an ''Over the top Island Experience''. 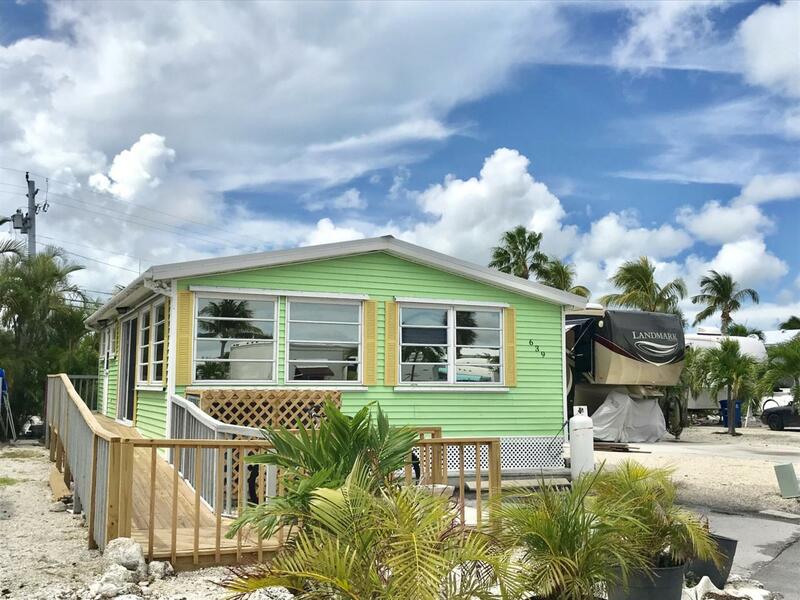 A perfect second home and great investment opportunity for vacationers who seek peace andtranquility in a Resort Community with Marina, Dual Boat Ramps, Spa, Pool, Ship Store, Tennis, Pickle Ball, Activities, Children's Playground, Common Areas and More!